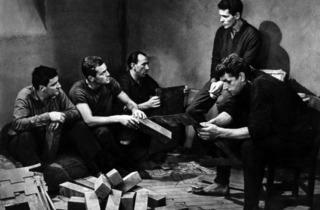 Released in 1960 and based on José Giovanni’s novel of the same name, which chronicled his involvement in a real life escape plan from Parisian prison La Santé, Le Trou was Jacques Becker’s 13th and final film. He died during the films post-production leaving his son, Jean, to finish the project. Claude Gaspard (Marc Michel), a mild mannered car salesman pending conviction for allegedly attempting to murder his wife, is introduced into a new cell occupied by four other convicts, Roland (Jean Keraudy, who was actually involved in the real life version of the story), Manu (Philippe Leroy), Jo (Michel Constantin), Monseigneur (Raymond Meunier). Together, the four have hatched a plan to tunnel through the prison floor into the underground sewage system and escape from the prison. Gaspard’s arrival is met with scepticism, however, they choose to involve him and move forward with their plan. It plays out like a heist, except with the harden crims trying to bust out instead of in, the promise of the rain soaked streets of Paris beneath their feet the treasure they so hungrily dig for. Becker handles what could have been fairly run of the mill material with aplomb and style, making a film that feels deeply personal. It is conscious, confident filmmaking that’s neatly packed. Everything in Le Trou has its place and nothing feels unnecessary. Becker watches his characters with such closeness, his camera deliberate and lingering as they share their food out amongst each other, capturing the lyricism in the reality of such small moments. Much of the films tension derives from the detail Becker so meticulously captures. The cell mates hammer at the floor in the cell with the metal leg of a bunk, the camera angel is high and tight as they one by one take turns smashing away at the harden concrete. The metal leg moves from person to person, but the camera never cuts and the progress unfolds in real time. We endure the efforts of the prisoners with them in a four minute take that leaves you sweaty and out of breath. Becker touches on trust and loyalty and observes the delicacy of the relationship between these men, their collective effort, ingenuity and drive to escape. This is simple filmmaking, an exercise in patience and a triumph in tension, with no score to accompany it, just the dull thud of metal on concrete and the men’s quiet determination. A truly excellent film.